Mt. Ellinor at 5944 ft. Located on the Olympic Peninsula in western Washington, in the Olympic National Forest. About an hour later, I found myself in a steep snowfield that could cover dozens of football fields, forcing each toe into the icy mountain; gripping the side of the snowy hill with my naked hands like a scared little monkey. My friend didn’t tell me there was snow up there…often all year around. He didn’t tell me they had just received several inches the night before. He didn’t tell me that I was going to slide off the precipice of an icy mountain to my certain death. Well, as convinced as I was, that luckily didn’t happen. 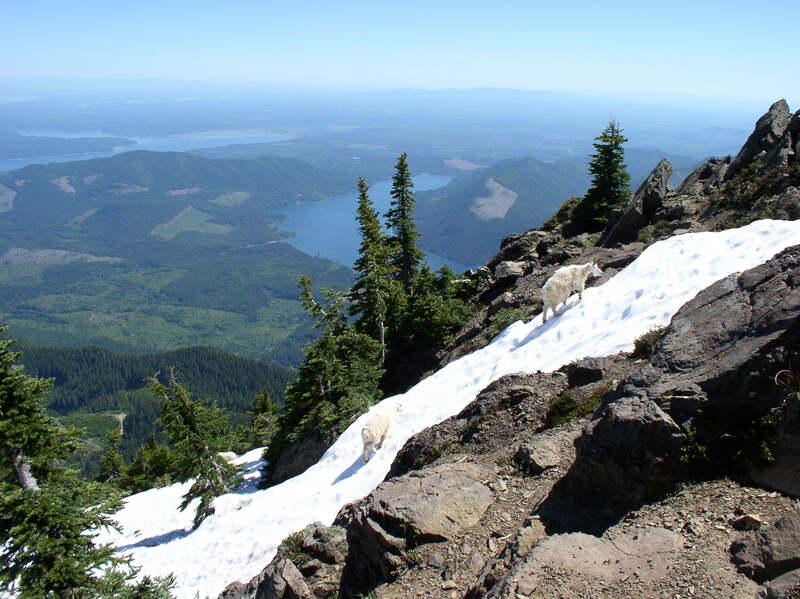 At the top, you are dealing with more snow, loose gravel, very steep terrain, rock outcroppings, and very possibly, wild Mt. Goats. There are several nice, flat areas at the very top, where you can lose track of time staring at the amazing vistas of snow-capped jagged peaks to the west and north, and river valleys and salt water ways to the south and east. And believe me, this makes it all worth while. I’ve done this hike with my wife and middle-school kids in August several years back, knowing what to expect. Bring a lunch, a walking stick, two bottles of water, a light jacket and an extra warm shirt, along with the other hiking essentials, of course. Pay attention to the trail that lies ahead of you, be very deliberate about your foot placement near the top, and relax. Enjoy the ride! Oh…the goats. Check with the nearest forest station before you go. At the time of this writing, the goats were considered a threat and the trail was closed. Seems silly to me, but I don’t make the rules. DIRECTIONS: From I-5 in Olympia, take US 101 north to Hoodsport. Turn left (west) onto State Route 119 and proceed 9.3 miles to a T intersection with Forest Road 24. Turn right onto graveled FR 24, proceed 1.6 miles, and turn left onto FR 2419. After 4.8 miles come to the lower trailhead. The upper trailhead can be reached by continuing on FR 2419 for 1.6 miles, where you turn left on FR 2419-014 and follow it 1 mile to the upper trailhead.